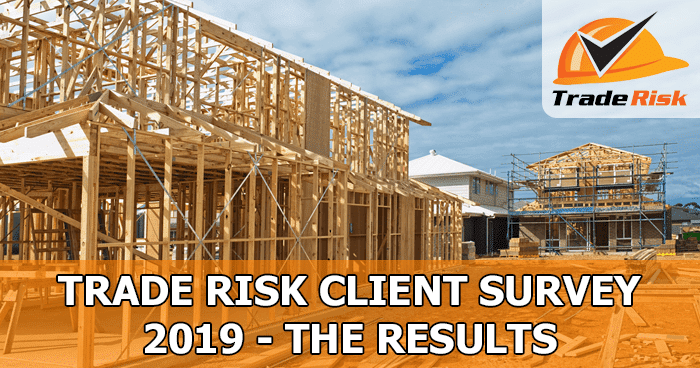 Thank you to the hundreds of Trade Risk clients who completed our first ever annual survey. Whilst we do send out customer service surveys whenever you purchase a new policy or renew a policy, this was the first time we have asked all of our clients at once what they are thinking. I’d like to share some of the results here. The first question asked our clients how likely they would be to recommend us to others, on a scale of zero to ten. The results are then used to calculate our Net Promoter Score (NPS). NPS is a scale used across the world in a wide range of industries. Any score above zero is considered a positive, as it means you have more ‘promotors’ than ‘detractors. The maximum score is 100, which can only be achieved by every person scoring you a 9 or 10. Before we reveal our score, let’s see what some other financial services businesses have scored. In the banking sector, ING Australia have the highest NPS at 48. In motor insurance the highest we found was RACQ with a score of 40, and in the health insurance sector it’s AHM with a score of 3. Looking outside of insurance at a brand that everyone seems to love, Apple has a score of 72. We knew we’d have a pretty good score, but this was quite special. Just under 80% of clients rated us either a 9 or 10, and just 1% rated us a 5 or lower. It means so much to us that you – our clients – are so willing to recommend us to your friends and co-workers. It’s what drives us to keep pushing. We asked all of you what we could start doing, or do better, over the coming 12 months. There were plenty of great responses, and of course quite a few people asked for “more cover and lower prices”. Of course we’d love to do that, but we have to actually make money! There was demand for more contact from Trade Risk. This generally was around contacting clients mid-term to check if their policy was still right for them, as well as letting clients know about other types of policies that could benefit them. This was great feedback, as it shows a lot of our clients care deeply about being properly insured, rather than just having insurance to get a certificate. We currently limit our outbound contact for most clients to renewal time, as well as email newsletters which go out a few times a year. Even then, we still get clients unsubscribing from our emails, so it’s clear that not everyone wants more contact from us! But we certainly take it on board, and will look at ways to keep better in touch with our clients throughout the year. And remember, you can always call or email your dedicated account manger whenever you need. A handful of clients mentioned discounts, such as loyalty discounts, renewal discounts and multi-policy discounts. These sound great in theory, but as your broker we feel we can do better than applying lazy discounts. What we do is check each year to ensure your insurance provider is still offering a competitive deal. We might not be able to offer a 10% loyalty discount, but if we can switch you to another insurer that is 10% cheaper, you’re still winning! We can’t find a cheaper option for every client every year, but because we deal exclusively in the trades we do have a pretty good feel for which insurance providers are offering the sharpest premiums for each different trade. Multi-policy discounts can be a little tricky as well, as typically your multiple policies will be spread across multiple insurers. So from the insurer’s perspective, you don’t have multiple policies. But what we’re doing here is spreading your insurance around to secure the best overall deal. We might find insurer A is best for your public liability and tools, insurer B is best for one of your utes and insurer C is best for your other ute. If we placed them all with insurer A you might have paid hundreds of dollars more, which would offset any type of multi-policy discount anyway. So we believe we find you the best overall deal without chasing discounts. Some clients were keen to read about claims case studies that were relevant to the trades. This is definitely something we’d like to get into, as we do see a lot of claims from various different types of trade businesses. Keep an eye on our blog for more information. We love looking after your business insurance, and we love the amazing feedback we receive for our services. But we sometimes wonder, what if we could help you with other business services, such as accounting, bookkeeping, graphic design, online marketing etc. Of course it wouldn’t be our insurance staff looking after this, as they specialise in insurance rather than accounting or graphic design! So we asked you, if we were to hire the appropriate people, would you use us for these services? The feedback was extremely positive, so we will be exploring these options in 2019. Other services which clients suggested were equipment finance, lending and assistance with business templates and documents. We never want to become a “jack of all trades” business, but if we could build teams in other specialist areas in the same way we have built our insurance team, then it’s worth looking at. Overall we want to be seen as the company that provides the greatest level of service and advice to small and medium sized trades businesses. Thanks again to all of our amazing clients who took the time to complete our survey, and even to those who didn’t complete it, but still support us by trusting us with their insurance services. We are here with the sole aim of supporting (and protecting) you and your business. If there’s anything else we can do for you, please get in touch.